Since house cleaning is often such an enormous and demanding undertaking, how can anyone other than trained specialists be expected to stay on top of it? Luckily, you needn’t waste another minute of your spare time on extra work around the house. The cleaners we provide at Handy Cleaners carry out nothing less than the best possible service; regardless of the size or scale of any given cleaning job! Now you can find all of this on your doorstep, and at a price that you’re sure to agree is both affordable and cost-effective! When you need a local cleaning company in North London to pick up the slack, call up 020 3743 0505 to get things moving quicker than any other alternative! How Can Our Cleaners in North London Help You Today? With our range of available cleaning services in North London, there’s nothing we can’t do when it comes to home cleaning. 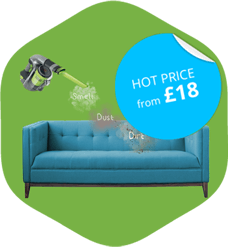 Let us take the weight off your mind with our personalised options, which include such helpful work as carpet or upholstery cleaning. All those specific tasks around the house that need a bit of a spruce up are exactly what drive us, and you’ll soon see what the expert touch is really capable of. We even undertake eco-friendly cleaning at every step, so you know you’ve picked a company with a conscience. We’d love to discuss the array of cleaning services we offer in detail, so never be afraid to talk to one of our friendly members of staff! The cleaners we send to help you are second to none in North London, and that’s because they come with all the knowledge and experience it takes to fulfil a perfect job. Friendly and personable, they’ll help you to get the most out of our cleaning services by discussing your needs in detail. The real magic happens when they set to work, however, and you’ll soon see why a little extra help with the home cleaning goes a lot further than you might think! Talk to us today, and let us know your exact requirements. We’re sure to be able to sort them out before you know it, so call up 020 3743 0505 to find out more! What’s To Know about North London? 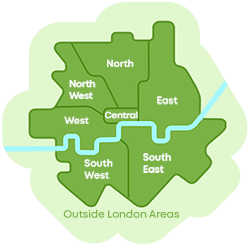 North London is a large and prosperous area, usually defined by its boroughs being north of the River Thames. It features an array of impressive surroundings within, such as Barking and Dagenham, Ealing, Harrow, Hillingdon and Waltham Forest. It has amazing educational facilities, perhaps best summed up in the London Metropolitan University. There are a great many parks and open spaces, especially in greenbelt areas such as Barnet (home to such parks as Golders Hill). You can even find museums and galleries all over, including Forty Hall in Enfield. The markets to be found in Camden are also some of the most vibrant stalls around and are usually not to be missed! Hire our cleaning company! Hold On To More Of Your Hard Earned Cash! Despite what many people think, hiring our cleaning company is actually a fantastic investment that saves you money. We pride ourselves at Handy Cleaners as the only choice in house cleaning in North London because of our affordable, yet quality, cleaning services. Our work can even help you avoid some big risks and hazards that come with a dirty or unclean home, and that kind of security just isn’t sold in stores! You can put your faith entirely in our teams of cleaners, and we can’t wait to show you how to get the most out of your property! Simply speak to us today by dialling 020 3743 0505 and you’ll soon be ready to go with a real local cleaning solution.